The Beal Booster III 9.7mm (Dry Cover) is a good versatile rope suitable for a wide range of activities; sport climbing, trad climbing and winter climbing. It falls in to a category of what many traditional British climbers would class as a skinny single rope, however most continental European climbers would consider it more as their go to rope for most situations. For those climbers more familiar with big heavy 11mm ropes the Booster should be somewhat of a revelation. Even in contrast to the best and most modern thick single ropes (10.5 / 11mm) the Booster is a significant improvement in handling, making it far easier to tie (and untie) knots and clip quickdraws. It also represents a significant weight saving; a 50m Beal Booster III 9.7mm should weigh 3150g versus a Beal Apollo II 11mm at 3750g. The Booster III seemingly dominated the high performance single rope market for a long time as its combination of great handling and relatively good durability offered users a significant step forward in performance. The Booster III offers better UIAA number of falls (10-11) in comparison to things like the Mammut Tusk 9.8mm (9-10) and the Mammut Galaxy 10mm (9-10) and a lower impact force of 7.3kN (Beal Guarantee) versus 8.8kN and 8.7kN for the Mammut ropes respectively. It even outperforms ropes like the Edelrid Heron 9.8mm; Edelrid’s flagship in the Edelrid Dry Line, with number of falls of 8 and impact force of 8.7kN. In actual use the Beal Booster III 9.7mm backs up its stats with exceptionally good handling properties; in back to back tests clipping quckdraws and runners on trad routes the Booster feels easier to clip than its competitors. Whilst only anecdotal evidence the Booster III seems to survive abrasion better than the equivalent Mammut Tusk 9.8mm in like for like climbing situations (Same routes and same conditions). In summary the Beal Booster III 9.7mm offers great statistics, fantastic handling and very good durability for a rope of this diameter. Dry Cover does help to keep sheath cleaner and less likely to become saturated when climbing in the wet (don’t expect miracles but it is a good improvement over a non-treated rope). Greater number of UIAA falls in comparison to many of its competitors. Lower impact force than many of its competitors. Good levels of durability for a rope of this diameter. A rope of this diameter won’t suit everyone; for example if you’re climbing on particularly abrasive rock types or routes. The Price? The price of many outdoor products have sky rocketed over the last few years and ropes have done so more than most. A £145 price tag may deter many people from buying the Booster. The Beal Booster III 9.7mm is arguably the best high performance single rope in its diameter category. 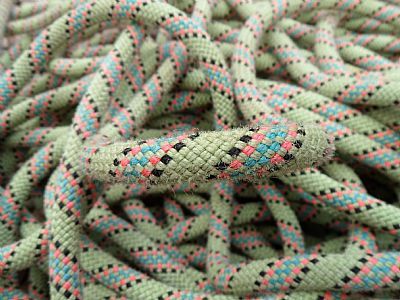 Whilst it may be expensive it offers significant performance advantages for those more used to thick single ropes (10.5 / 11mm) and even for those used to alternatives in its diameter range.